As The Feminine Gift grows and changes, we will be welcoming new writers to our little community. The following is a post written by Becca, a grad student and part-time blogger over at Faith& Peanut Butter. When not buried in books, she enjoys traveling, hiking, and messing about outdoors. Just over a year ago I went through a really difficult break-up. It was very challenging but through it all I really felt the presence of God. One thing that really helped me through the restlessness as the months passed was delving into the mystery of my own feminine heart and learning about what JPII called “the Feminine Genius”. Looking at a woman’s heart and intuition has taken theology, and my own prayer life, to an entirely different level! At some point during that autumn I read a beautiful blog post about one of the frescos in the Sistine Chapel: the renowned “Creation of Adam”. 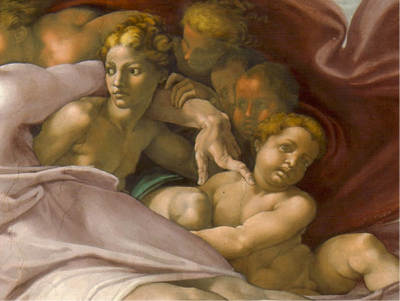 In this famous fresco, completed by Michelangelo Buonarroti in 1510, the focus is most often placed on Adam and the awkward handshake a little reminiscent of E.T. But it is the presence of Eve that really intrigues me… If you look closely, you see her positioned under the Father’s arms on the right side of the fresco, within the red cloak and surrounded by the angels. As women, our intuition, receptivity, and maternity (both spiritual and physical) bring us closer to the heart and mind of God. Perhaps this is why women are never satisfied; we have a capacity for the infinite!! Union with the heart and mind of God inevitably leads to a divine restlessness. This past June I went on an epic pilgrimage, walking the Camino Frances and then visiting Rome. On my last day in the Eternal City, I visited the Vatican Museum specifically to check out the Creation of Adam. We were packed like sardines into the Sistine Chapel—it was literally standing room only that warm and sticky day in Rome—but as I gazed up at that fresco, time seemed to stop. I revelled in the thought that I am able to uniquely know the heart and mind of God. I felt the Lord making a promise to me…to safeguard my heart and gently prepare me for my future vocation. God is gentle and loving and wants to give you the desires of your heart—but first and foremost, He wants you. 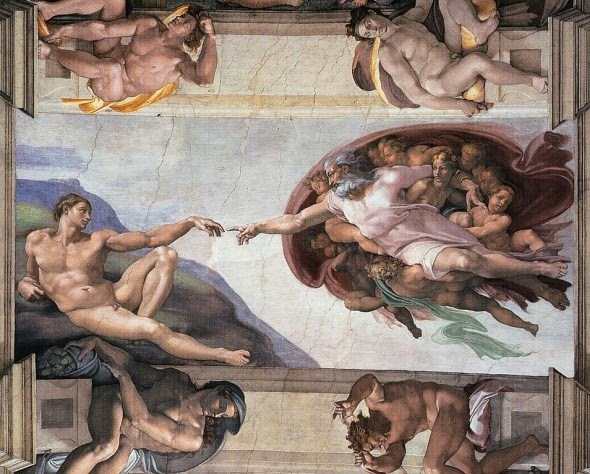 So with Valentine’s Day behind us and the promise of spring around the corner, why not meditate on the spiritual truth that both Michelangelo and Maya Angelou hone in on? Dig into the beauty of your own feminine genius so that you can image God’s love to the world!